The Keystone Test: Will President Obama Pass? Yes, he said the word “climate”—but he hasn’t committed to any of the big steps needed to avert catastrophe. The laws of physics and chemistry don’t grade on a curve; neither should anyone who cares about the fast-approaching catastrophe of runaway climate change. Yes, President Obama managed to say the C-word, more than once, in his State of the Union address. He connected the dots between greenhouse gas emissions and the horrors of Superstorm Sandy and last summer’s record-breaking heat and drought (drought that has worsened this winter in much of the Farm Belt). And after making what he surely knew was a fruitless plea that Congress pass legislation to limit US greenhouse gas emissions, Obama affirmed that he will take action if Congress doesn’t. This constitutes unmistakable progress from a president who has been all but AWOL from the climate fight for most of his presidency. But unmistakable progress is not the same as sufficient progress. Humanity is staring down the barrel of a calamity beyond measure, and the president is one of the few people on earth who on his own authority can do something about it. Despite the welcome tone of his rhetoric, however, environmentalists weren’t especially heartened by his speech. Obama failed, yet again, to commit himself to any of the most important steps to halt climate change that, as president, he could implement unilaterally. He also indicated that he remains wedded to an “all of the above” energy policy that splits the difference between fossil fuels and green energy. Five days after the president’s speech, in a massive display of grassroots determination spearheaded by the Sierra Club and 350.org, at least 35,000 people gathered on the Washington Mall in the frigid cold. 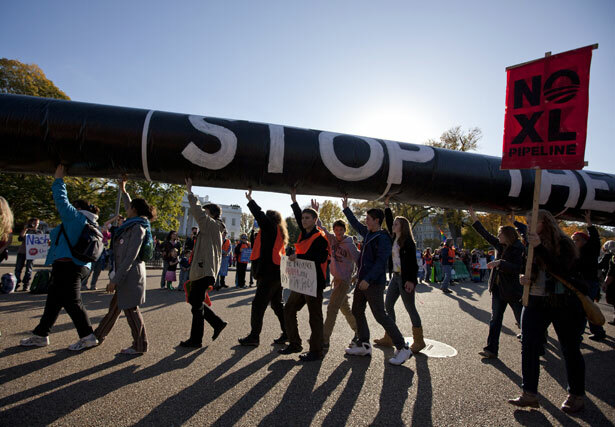 They had a clear message for the president: say no to Keystone XL. As Sierra Club executive director Michael Brune put it, “Mr. President, we have heard what you’ve said on climate; we have loved a lot of what you’ve said on climate. Our question is: What will you do?” The assembled crowds—young, vibrant and diverse—could only hope that Obama would hear his words. Activists are also homing in on John Kerry, the new secretary of state, whose impressive environmental record will be tested when his department renders a decision on Keystone this spring. As significant as Keystone XL will be to the president’s (and secretary’s) legacy on climate, there is much more that can be done without congressional approval. Indeed, directing the EPA to impose a national cap of 350 parts per million on greenhouse gas emissions would accomplish even more. Obama could order the EPA to ratchet up emissions standards for existing coal-fired power plants, which are responsible for roughly a third of US emissions. Blocking, or at least opposing, coal exports to Asia is a third step. Minimizing new oil and gas production, and prohibiting it outright in the Arctic, is a fourth. But Obama has done none of this, attempting instead to mollify both the fossil fuel industry and environmentalists—promising on the one hand to expedite new oil and gas leases and boost oil and gas production on public lands, while on the other hand vowing to “do more” about climate change and touting a market-based approach to limiting carbon emissions that has no chance of passing Congress. Obama’s approach may sound reasonable inside the Beltway, where concerns about swing voters and the electoral chances of Democrats in fossil fuel states are paramount, but it is utterly out of touch with what really matters: the physical facts of what happens when carbon-based fuels are burned and released into the atmosphere. No less an establishment voice than the International Energy Agency recently concluded that two-thirds of the world’s fossil fuel reserves must stay in the ground if humanity is to have a fair chance of limiting global warming to 2°C (which is hardly a safe level, considering the punishing impacts we are already experiencing at barely 1°C of warming). In fairness to Obama, implementing the right climate policies in the face of ferocious opposition from the fossil fuel industry— the richest business enterprise in history—is no easy task. And it’s not Obama’s fault that recent presidents and Congresses have denied and delayed action against climate change and thereby boxed him, and us, into this corner. But boxed in we are, and it doesn’t help to pretend otherwise. The reason we don’t hear politicians, or the “serious” people in our media, talking (at least in public) about this situation—the true gravity of it—is that to grapple with this in any real way, to propose anything that would actually begin to address it with the necessary urgency at the national and global level, would simply sound too extreme, if not outright crazy. Leave fossil fuels in the ground? You must be joking…. This is the reality—or the surreality—of the historical moment in which we find ourselves. At this late hour in the climate crisis, with the clock ticking down on civilization, to be serious about climate change—based, mind you, on what science and not ideology prescribes—is to be radical.